Hello friends! Yes, I am making good on my threats to post here more often. Today's post will be devoted to what today's schedule will probably (unfortunately) look like for most of us. I should start off by saying that I don't mind the occasional meeting, pep talk, or workshop. They can be good opportunities for exchanging information with colleagues, learning new things, and recharging. That makes it particularly tragic that so many of these days are purely wasted. Straight-up facts can be disseminated in a memo. Think people won't read it? Explain that the memo will take the place of 30 minutes' worth of lecturing during a PD and I bet people will read it. If you're really that concerned, attach return receipts in an e-mail so that you know people have opened them. DO NOT, UNDER ANY CIRCUMSTANCES, WASTE TIME READING MEMOS OUT LOUD. Ask us what we'd like to learn. Offer ten or so options and let people pick their three favorites. Allow write-ins. Make a "menu"-type schedule so people can attend meetings or workshops that appeal to them. 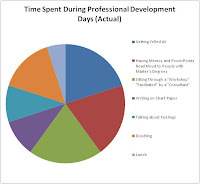 Avoid "consultants" unless teachers ask for certain presenters! We'd much rather hear from our colleagues who are teaching the same students in the same building. Finally, allow time for teachers to meet in small groups as grade or subject partners. There is nothing less useful to me than working on a math PD with a bunch of math teachers, no matter how smart or helpful or hard-working my math colleagues are. Teachers wouldn't make such issues over days like tomorrow, or Election Day, or Brooklyn-Queens Day, if they were more like opportunities for self-directed learning and growth and less like...well, what they are now, which is, usually, anything but that.